Theatre Direct Canada, a leading creator and innovator in theatre for, by, and with youth announces the featured lineup of Forward March Festival – a dynamic showcase of cutting-edge new theatre writing and an exciting lineup of music, audio and visual art, and performance by emerging theatre artists. Weekday programme welcomes students in grades 9-12 into a daylong interactive journey inspired by the plays and their themes while weekend activities expand to include multidisciplinary programming including engaging talks and roundtables as well as a series of performances emerging from the prompt A Letter to My Younger Self. 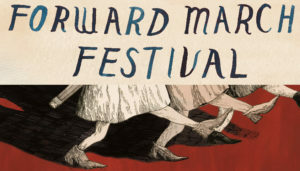 Forward March Festival will take place March 4-10, 2019 at The Redwood Theatre in Toronto’s East End. The inaugural lineup features new and yet to be produced plays by female-identified writers probe complex and controversial subject matter and bravely delve into rich emotional territory. Bessie Cheng’s Dirt, which won the Ellen Ross Stuart Award and was nominated for the RBC Emerging Playwright Award, is a queer coming of age story that follows two boys of opposing ethnic groups growing up as best friends in Urumqi, China. Elena Belyea’s Cleave looks at the experience of an intersex teenager and how starting a new school affects them and the people around them. Michaela Jeffery’s WROL (Without Rule of Law) is a darkly comic coming-of-age story about a determined troupe of adolescent girl ‘doomers’ who are committed to preparing for survival in the post-collapse society they are convinced won’t prioritize them. Finally, Hey May Hey, a new play by Chelsea Woolley, an awkward girl named May vows to go on a silence strike after the loss of her father.